Pictured are: Julie Hoffmann, America Needs You Executive Director; Corboy & Demetrio’s Rita Planera, Lend-A-Hand Board Member; Nancy Camacho, Fellow, University of Illinois at Chicago; Cameron Jordan, Mentor Coach, Skadden, Arps, Slate, Meagher & Flom LLP; and David Kirshenbaum, ANY Board Chair, Vilco Real Estate. American Needs You(ANY) Illinois, which provides mentorship and career preparation for low-income, first generation college students, was the recipient of the 2017 Thomas A. Demetrio Award of Excellence. 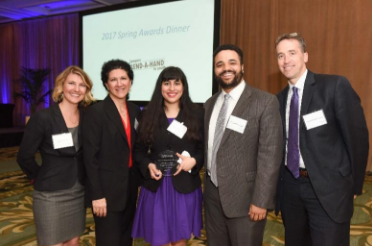 The annual award, funded by Thomas Demetrio, was presented to the group at the Lawyers Lend-a-Hand Annual Spring Awards Dinner. The award, named in honor of Thomas Demetrio, President and Co-founder of Corboy & Demetrio, is given annually to tutoring and mentoring programs that impact the lives of underprivileged youth. In 1992, the Lend-A-Hand Award of Excellence was created by Thomas A. Demetrio while he was President of the Chicago Bar Association(CBA), with a desire to impact the lives of Chicago’s underprivileged children by recognizing the efforts of exceptional tutor/mentor programs in the Chicago communities. From this Award was born the Lend-A-Hand Program. 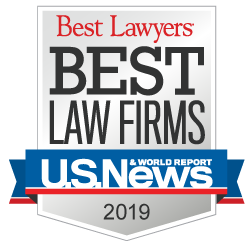 The Chicago Bar Foundation(CBF), with the leadership of the CBA, initiated the Lend-A-Hand Program in 1995, and it has continued to evolve ever since. The CBA and CBF created the Lend-A-Hand program in dedication to the lasting memory and generosity of the Honorable Abraham Lincoln Marovitz, Judge "Abe." Thomas Demetrio is a Life Fellow of the Chicago Bar Foundation and served on its Board of Directors from 1994 to 1996. He has served on the Lend-A-Hand Advisory Board since 1994.